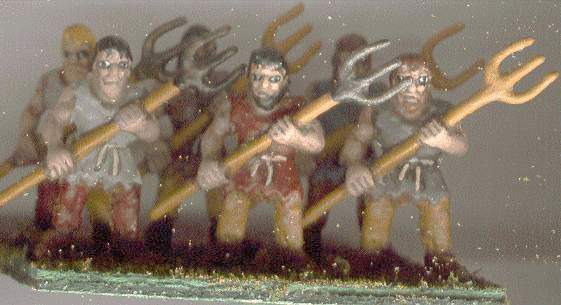 About five or six years ago, I decided to build a set of armies for the Dark Ages, a period that was virtually untouched in 1/72 is the Dark Ages. 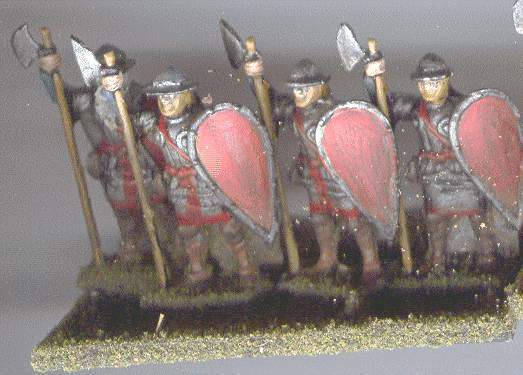 Actually, this has changed, but when I started this project, the only Dark Ages sets out there were Revell’s Normans and Saxons, which were seriously under-horsed and out-of-production anyway. The final products are posted here: Normans, Saxons, Vikings. 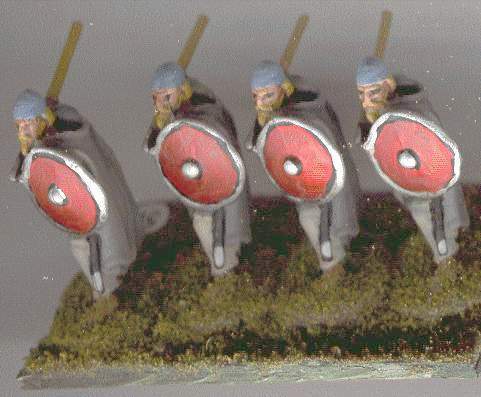 When my brother gave me a bag of 28mm Vikings, I started thinking about doing the period in lead. Then it struck me — there is a (relatively) cheap way to do lead: do it yourself. I had always known about Prince August’s molds, but never saw them for sale, until I stumbled across the Dunken’s website. 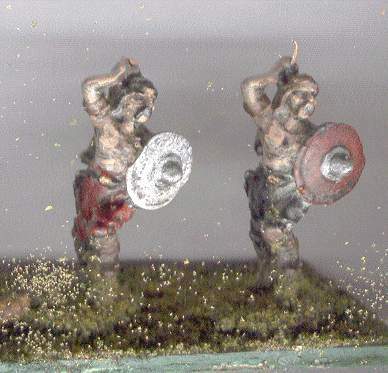 Two molds looked great for the period: 681 Barbarian Raiders and 667 Mounted Warrior and Horse. The barbarians are obviously a Viking, Saxon, and Gaul. The first two I basically could use as-is, although it would turn out that some castings had to have their axes & spears replaced, and I eventually converted a few of their shields to the kite-shaped “Norman” style (which in all probability comes from either Denmark or the Middle East originally…). 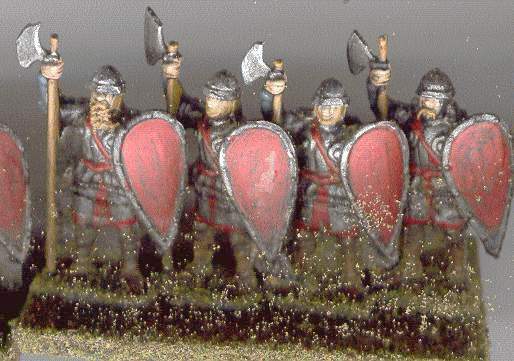 The Gaul is suitable to portray a Viking berserk or a Saxon slinger (the hand is open for a sword but a simple sling made of paper can be substituted). 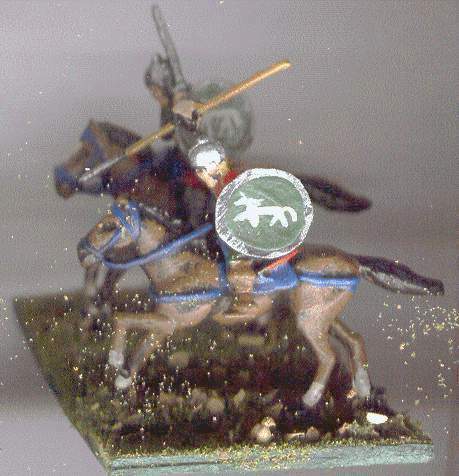 The mounted warrior, unfortunately, is closer to true 25mm scale than the infantry, but they still work. 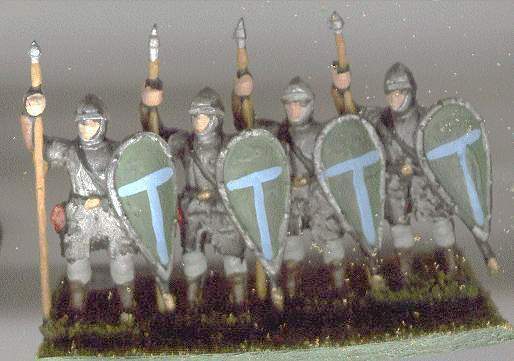 The basic figure has only a sword, but adding a shield is simple enough, and as you can see it is possible to add a spear and even a new arm to hold it properly. He wears a nasal helm, typical of the the period, but no armor. I painted the tunic silver on some to give a mailed look and it is passable. 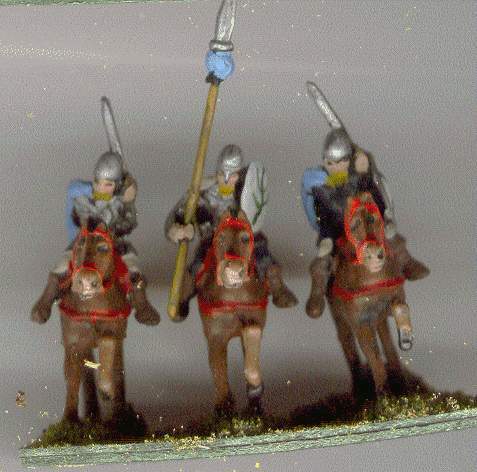 The Normans are of course one of the attractions of the period so apart from the cavalry I needed to improvise infantry, and fortunately I had a selection of 28mm plastics handy, from the Lionheart game and the Weapons and Warriors game. The W&W knight figure is a “general” and I used one for a casualty figure and another for the knight in my Caverns of Doom gift game. 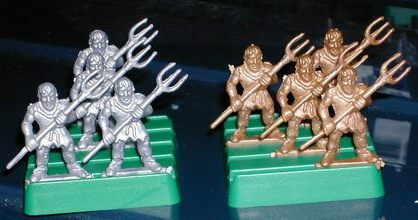 The W&W sets came with tons of the soldiers at the right, with kite shields and polearms (bardiches or volgues). At some point I may take better closeups of the modified figures, but for now I’ll re-use my scanned pics from back then. A lot of flock was shed onto the scanner bed (creating the weird spots around the bases). I also converted one peasant into a monk figure for my Caverns of Doom set. These are metal, from the PA mold. I used cheap metal, including solder, so not all of them cast perfectly. The general (white beard) has a sword, courtesy of a Gaul. I couldn’t place them on the scanner on their backs as the slings are made of paper stiffened with white glue and would probably break. As you can tell, they barely fit onto the 60mm frontage even with bases trimmed. They were given longer hauberks with some thin paper glued over their crotches and thighs. The capes were also paper and glue. These had the brims filed off their helmets, longer hauberks added as on the Huscarls, and polearms trimmed into spears. The far left is standard figure. The center had an arm replaced, lance added, and the last just had shield added. 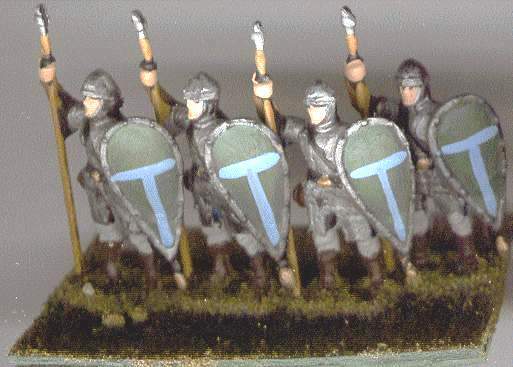 Most got the appropriate kite shield but some have round shields as in this picture so I could also morph them into Rohirrim to fight my fantasy troops. This is a common pose from the Bayeux tapestry. 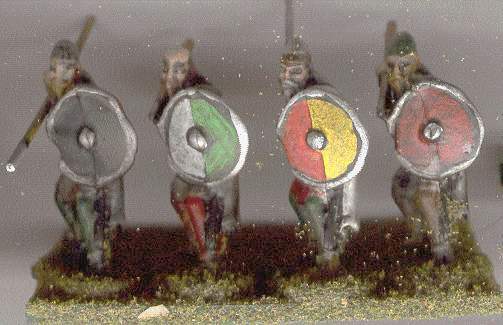 Again the shields are more appropriate for Rohirrim than Normans. 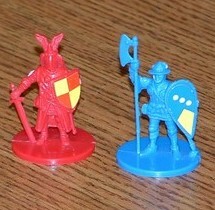 So with a combination of PA molds and plastic game pieces, I constructed two armies with several morphs. 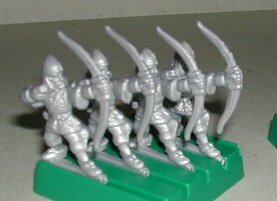 I’ll eventually photograph some Lionheart archers converted to Normans (basically the helms were filed down to remove the cheek flaps and neck protection, so they would look like conical Norman helms) and perhaps some Vikings.